The Park Forum – Cultivating sustainable faith through Bible reading, reflection, and prayer. Every year, the dark of Winter begins to recede as the light of Christmas comes. The Church set the celebration of Christmas at the point of the winter solstice specifically for the teaching metaphor astronomical science provided. Easter however is set around a historical date and time. Easter and the dates directly related to it, are the only celebrations of the church year that happen on the dates they actually occurred. Easter’s date, at least at the beginning, was related to the date of Passover, which was set, not by any calendar of modern or ancient man but, by God. In many ways, Easter is the true beginning of the Church year. It is where the fresh newness of life springs up. It is where the root of the church sprouts. So, although most of our readers are not blessed with the tropical climate of Trinidad, we join today in this joyous prayer, thanking God for the return of life, the return of warmth, and for the strength to walk into a new day with all its struggles and challenges. As this prayer asks, may we worship, slow down, and live in fruitfulness. I praise you for these songs and sounds of joy. Uphold me as a living sign of your presence in my life. Let me be eager to tell of your eternal goodness. By your grace to face the challenge and the hardships. With your joy to celebrate that all things come from you. With divine compassion to reach all those who need your love. I pray for the fruit, gift, and fullness of your Holy Spirit. In the name of my Lord and Savior Jesus Christ I pray. The first day of the week, most commonly called the Lord’s day—the kyriaka or dominica—was taken as a celebration of the three great events of salvation history: creation, resurrection, and consummation. We return again this Easter Monday as last, to consider the challenge of N.T. Wright, in Surprised by Hope, to celebrate Easter fully. After all, Easter is not a happy ending. It is a happy beginning. I regard it as absurd and unjustifiable that we should spend forty days keeping Lent, pondering what it means, preaching about self-denial, being at least a little gloomy, and then bringing it all to a peak with Holy Week, which in turn climaxes in Maundy Thursday and Good Friday…and then, after a rather odd Holy Saturday, we have a single day of celebration. 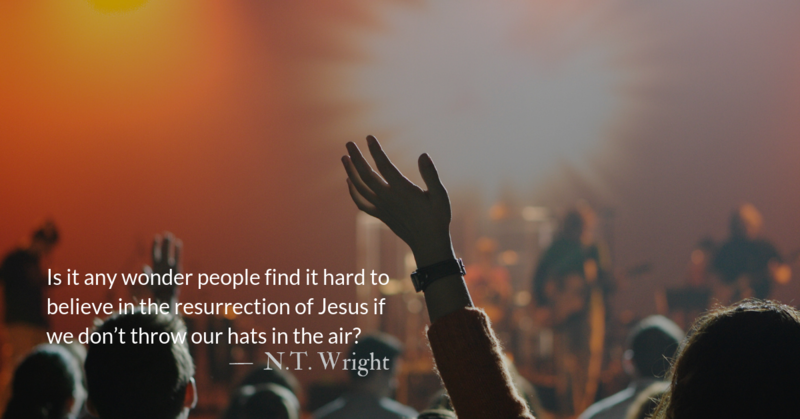 … Is it any wonder people find it hard to believe in the resurrection of Jesus if we don’t throw our hats in the air? Is it any wonder we find it hard to live the resurrection if we don’t do it exuberantly in our liturgies? Is it any wonder the world doesn’t take much notice if Easter is celebrated as simply the one-day happy ending tacked on to forty days of fasting and gloom? It’s long overdue that we took a hard look at how we keep Easter in church, at home, in our personal lives, right through the system. And if it means rethinking some cherished habits, well, maybe it’s time to wake up. Easter is not the “end” but the beginning of our new, joyous life in Christ. We don’t get to go back to “normal” even if we go back to what we gave up for Lent. Normal is dead. Going back to normal means crawling back into the tomb. If we are to live in Christ, it must be a new kind of living. If, like Cleopas, we try to find happiness and joy by going back to Emmaus, Jesus will intercept us. If, like Peter and the other disciples, we try to find fulfillment going back to fishing for fish instead of fishing for men, Jesus will call to us from the shore with breakfast cooking on a fire. Easter is a season in the church calendar, not a day. But in our lives, it can be an evergreen season that blooms throughout the year. Let us abandon our destinations for his, and let us leap out of our boats, swimming to shore when he calls. Let us see what the risen Christ will say to us today. “Waking up” to Easter may be a disruptor to our ordinary lives. If we are honest, we’d rather get on with the world now. We want to go back to winning at life and move past all of this gloomy suffering and servanthood. On the day the Church now calls Good Friday, when Jesus hung on the cross and cried out, “Eli, Eli, lema sabachthani,” people were confused about what he meant. Some even thought he was crying out to Elijah. Truthfully, we don’t know exactly what was in Christ’s mind, and we also don’t know that he wasn’t thinking multiple things all at the same time, as most humans do in stressful and painful situations. The clearest, simplest explanation that I lean toward is that Jesus was intentionally quoting Psalm 22, which appeared in our reading plan on Palm Sunday. Jesus knew that most of his audience would recognize the quote and understand that he was referencing the entire psalm. If I said, “To be or not to be,” many people would recognize that I was referencing Hamlet’s entire monologue and its meaning. People less familiar with Hamlet might be confused. Some might think it was from some other source, such as an Arnold Schwarzenegger film. 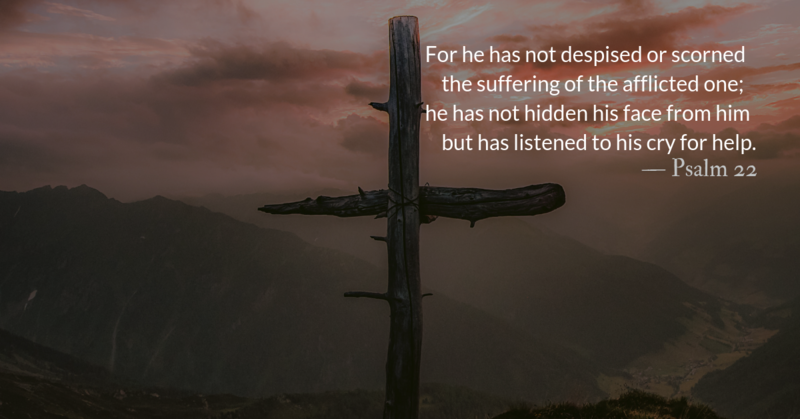 So, on this Good Friday, we will join Christ in his suffering, praying excerpts from this psalm prayed on the cross, ending with excerpts from Psalm 30 from our reading for today. Make these psalms our prayer, today and over Holy Saturday as we await the joy of resurrection morn. It’s easy to think that when Jesus referred to laying his life down for his friends, he was referring to his imminent death on the cross. But stopping there simplifies what Jesus did — and what he said — into one single act. In the Holy Scriptures there are many names and titles which are applied to our Lord and Saviour, Jesus. He is said to be the Word; He is called Wisdom, Light and Power; right hand, arm and angel; man and lamb, sheep and priest. He is the Way, the Truth, and the Life; a vine, Justice and Redemption; bread, a stone and doctor; a fount of living water; peace and judge and door. Yet, for all these names—which are to help us grasp the nature and range of His power—there is but one and the same Son of God who is our God. These then, are His names; but what are the meanings of these names? He is called the Word, first, to imply that He was begotten of the Father with no more passivity or substantial diminution in the Father than there is in a person who utters a spoken word. Second, for the obvious reason that God the Father has always spoken through Him both to men and angels. The name Wisdom tells us that in the beginning all things, through Him, were ordered wisely. He is the Light, because it was He who brought light into the primordial darkness of the world and who, by his coming among men, dissipated the darkness of their minds. Power is one of his names, since no created thing can every overcome Him. He is a right hand and arm, for through him all things were made and by him they are all sustained. He is called an angel of great counsel, because he is the announcer of his father’s will. He is said to be the Son of man, because on account of us men he deigned to be born a man. He is called lamb, because of his perfect innocence; a sheep, to symbolize his Passion. For two reasons he is called a priest: first, because he offered up his body as an oblation and victim to God the Father for us; second, because, through us, he condescends day after day to be offered up. He is the Way along which we journey to our salvation; the truth, because he rejects what is false; the life, because He destroys death. 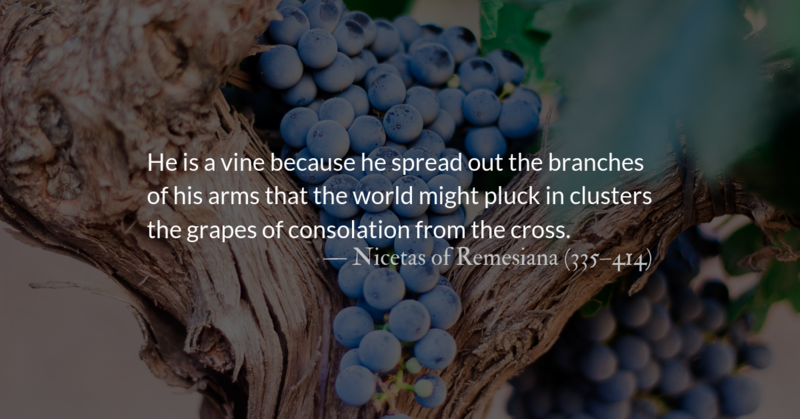 He is a vine because he spread out the branches of his arms that the world might pluck in clusters the grapes of consolation from the cross. Jesus gathered the disciples around him, took a towel, poured water into a basin, and washed their feet. He served them with love and humility. As his followers, we are called to do the same. I prepare and post these devotionals approximately 36 hours before they go out, so as I finished writing this post and prepared it for posting, Notre Dame was still smoldering. Our joint suffering with and for one another is part of being made one in Christ. May our prayers continue to rise for our brothers and sisters observing Holy Week in the midst of such tragedy. Wednesday is the day that it is most likely that Judas sought out the religious leaders to betray Jesus. It is amazing that it took this long. John tells us that Jesus knew early on who the betrayer was and that, early in the week, the idea was already placed in Judas’s heart, by Satan. His motivation could have been simple revenge for being corrected publicly about Mary’s offering. His motivation could have been merely financial. (He was already stealing from Christ’s ministry fund.) But it is surely more complicated than any one, simple reason. By Wednesday it was evident that the nationalistic dreams of the disciples and the crowds who waved palm branches (a symbol of the Maccabean revolt) were not shared by Jesus. He didn’t attack the Romans. He met with Greeks. He even failed to endorse a religious exemption for paying taxes to an idolatrous government. 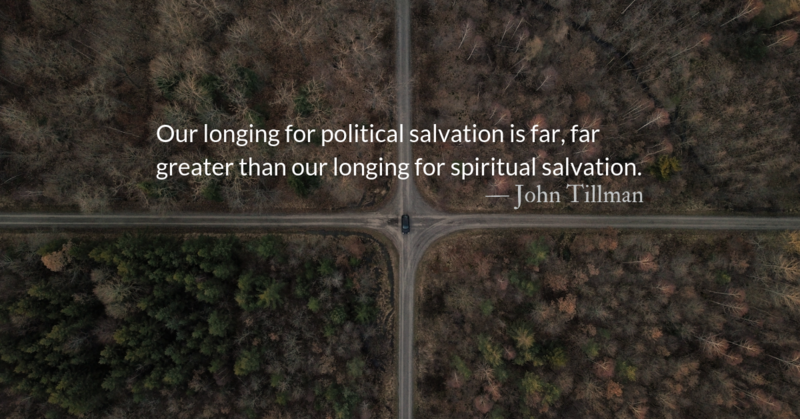 Like the disciples, our longing for political salvation is far, far greater than our longing for spiritual salvation. This is because we don’t want to be made better people. We prefer others be forced to subject themselves to our weaknesses and sins—to accept us the way we are. We are setting ourselves up for disillusionment if we mistakenly believe that Christ’s mission is to set us up in power, to bring us earthly authority, or to establish any kingdom other than a heavenly one. By the end of the week, Judas will be dead and Jesus will step fully into the role John the Baptist first identified him as: The Lamb of God. He is the rejected one, the one who washed his betrayers’ feet, the one who submitted to death, the one who forgave his executioners. 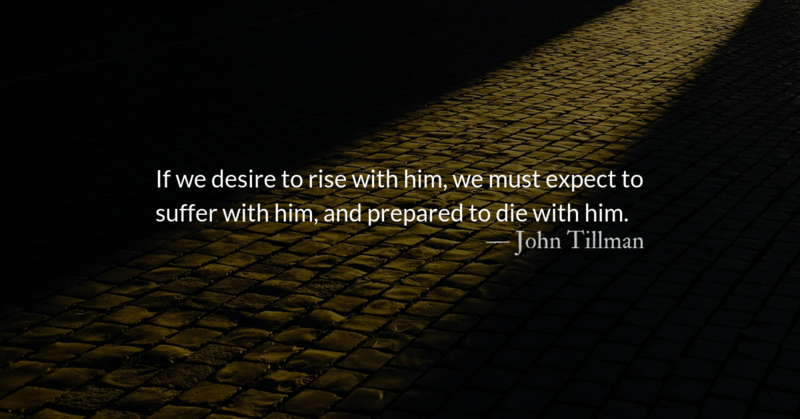 If we want to rise with him on Sunday, we must be prepared to die with him on Friday. Jesus and Judas both offer us a path to follow. What do we long for more than we long for Christ? Not letting go of it is choosing the path of Judas. Jesus Christ Superstar shows Jesus’ last week of ministry as the looming failure that Judas must have perceived it to be. Imagine his face looking at Judas…The look you imagine on Christ’s face in these moments says a lot about what you believe about who Jesus is and what his character is like.